Speaking of “the sky’s the limit” as just an ordinary phrase, Bombay Club bar manager Bret Daniel had quite a surprise serving a couple in New York City a decade or so ago. 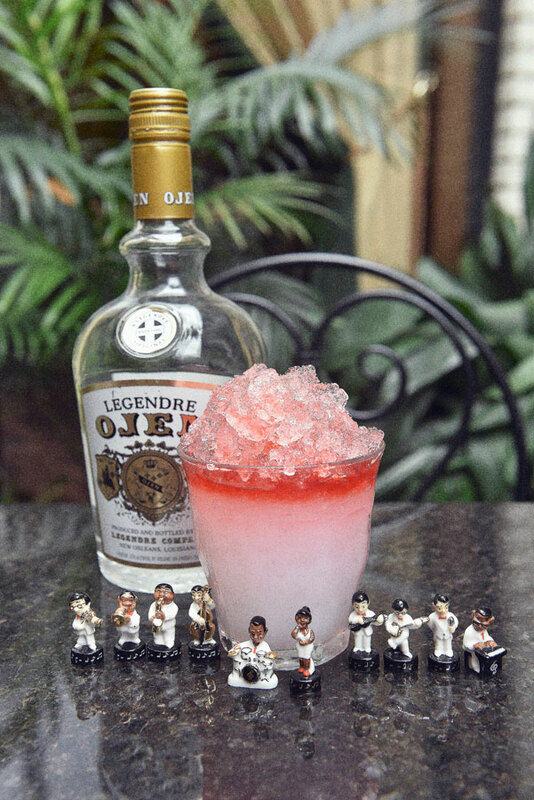 Daniel first wants to encourage Bombay Club patrons to order the Legendre Ojen Cocktail made from the iconic liqueur flavored with anise that is a tradition during the city’s Carnival season. “I was only 22 and just back from a military excursion in Japan, and working at this little dive bar,” Daniel’s story begins. “I was waiting on this couple who breezed in out of the cold weather and sat down at the bar. Royal Frenchmen Hotel bar manager, Ferrell Dugas, has been present for many of both the happiest, as well as forlorn customers in her dozen or so years working behind the bar. However, it is Mostly the cheerful patrons. A New Orleans native, Dugas, worked the bar at world- renowned Commanders Palace restaurant for the past 11 years. Now, as bar manager for the Marigny’s most captivating boutique hotel, she and her staff take good care of hotel guests and walk-ins. Really, when you think about it, who isn’t having fun in the Marigny?! The hotel is located on the corner of Royal Street and Frenchmen across from Washington Park-- with 16 distinctively decorated rooms, 3 spacious suites, and a charming courtyard. The bar is inside the hotel foyer with a small kitchen nearby ready to dispense Happy Hour bar bites to be served alongside the Royal Frenchmen’s bar drinks. Happy Hours, from 2 p.m.-7 p.m. daily, should cheer up any bar patron because everything is 20 percent off during Happy Hour. Dugas notes that the current signature cocktail is a French Royal 75, but that iconic local drinks like Sazeracs, La Louisiane, Vieux Carre, Ramos Gin Fizz and Pimms Cup are also often requested along with Old Fashioneds. “One of our house-originated cocktails, Purple Rain, is made from hibiscus tea which gives it a kind of lavender hue,” said Dugas. Other ingredients are Big O ginger liqueur, bourbon, Peychauds Bitters, and some chopped ginger, she noted. The on-and-off-the menu bar bites offers both cheese and charcuterie boards, crawfish gnocchi, pulled pork sliders with both house made cabbage slaw and pickles, buffalo chicken sliders topped with micro greens and Cholula sauce, goat cheese and pear, handmade pies and fajita nachos with red and green bell peppers, pineapple salsa, house made guacamole, queso, sour cream and tortilla chips. 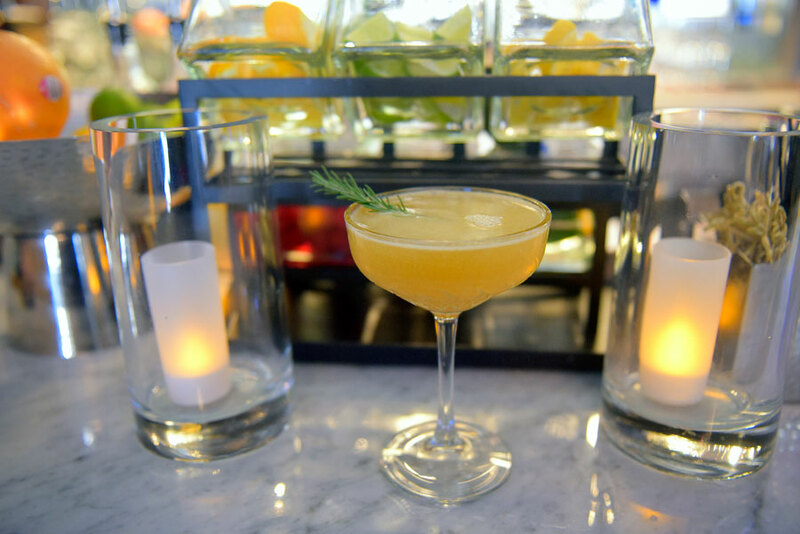 Effervescence, the French Quarter’s newest, most exciting Champagne-bistro has an audience of patrons who always seem to be maxed-out with merriment!! Located on historic North Rampart street, the circa-1890s Victorian cottage has been renovated with the utmost care, stylish design, and detail. A charming patio with outdoor seating and a central fountain adds to the charismatic atmosphere. If anyone for any reason feels just a little “off,” owner Crystal Coco Hinds and her crew have just the answers: Bubbles + Troubles sparkling wine cocktails! The Prosecco Pop is a double whammy with a seasonal Popsicle and Italy’s gift to the sparkling wine world, a topping of Prosecco. A Honey Island Daiquiri seems so perfect with New Orleans’ pot-distilled Roulaison rum, honey liqueur, and lime, joined by sparkling Tokaji from Hungary. Café Olé consists of reposado tequila, Congregation Coffee cold brew, pecan, Trentino, Italy’s Amaro Sfumato, chocolate bitters, and a French sparkling Crémant de Bourgogne. Dutch Alley pays tribute to the Netherlands’ Boomsma Genever, with Alpine preserve liqueur, Italy’s Barbera d’Alba Contratto Fernet, Satsuma, and the Spanish sparkling Mestres Vins de Cava. Bossa Nola, based with Novo Fogo Cachaca, captures the spirited Brazilian national drink, Caipirinha, with Contratto bitters, pineapple, lime, and sparkling Rivarose Brut Rosé from Provence. A Family Affair features the Nola distilling Company’s vodka, made in Louisiana from sweet potatoes, with Averall Danson Gin liqueur, Domaine de Canton, and oleo-saccharum – a 19th century bartending method incorporating seasonal citrus flavor and aromas with sugar to make syrup for cocktails. The topping? Spain’s Avinyo Cava Rosé. Templeton Rye Whiskey, amaretto, sour cherry syrup, and lime with a sparkling Moscato d’Asti make up the Parrain. 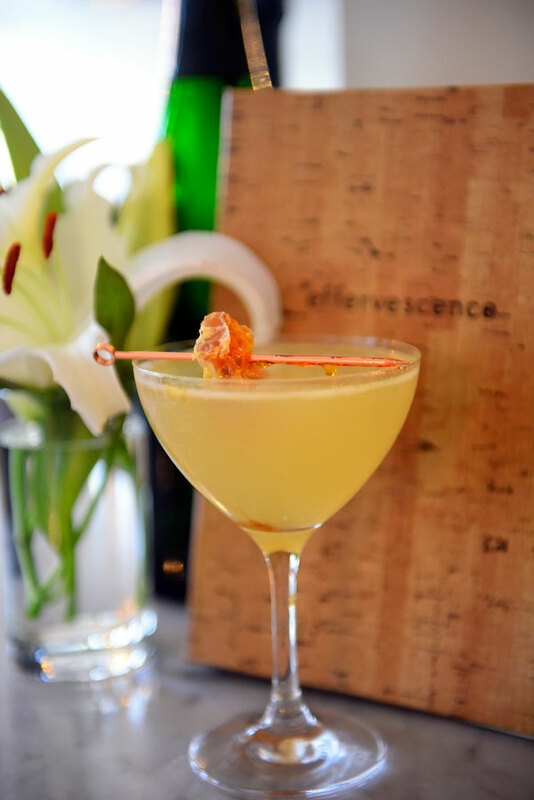 Bites and flights of deliciously prepared dishes can be ordered from Effervescence’s kitchen to pair with the stunning drinks. A seafood Plateau feeds a small group while smaller bites include West Indies Crab salad, Royal red Shrimp, Murder Point Oysters, Snapper Aji Amarillo Ceviche, grilled half wheel of cheese, pommes frites, beef and panisse bites, and many other tasty treats. Patrick’s Bar Vin continues to gain more excellent reviews since the owner-proprietor, Patrick Van Hoorebeek opened to much hoop-la 7 years ago. Named a top-10 wine bar in the U.S. by both Gayot and Fox News, Patrick’s Bar Vin has become a top draw for wine and spirits enthusiasts throughout the world, as well as winery and distillery business owners. Van Hoorebeek who is New Orleans’ semi-official Belgian bon vivant, is also is the permanent King of the Krewe of Cork, a parade organization that he organized in 2000. The Krewe of Cork parades twice a year, once during carnival, on February 2 this year, and during the New Orleans Food and Wine Experience, Royal Street Stroll, May 24. In addition to parading, members enjoy monthly dinners, parties, and other social get-togethers. Every year, a Grand Marshall is selected as the ceremonial leader of the parade. This year’s honoree is Andrew Brown, the CEO of Precept Wine in Seattle and founder of Browne Family Vineyards. Patrick carries a number of Browne’s wines at Bar Vin, particularly the Washington State Browne Cabernet Sauvignon and Browne Sauvignon Blanc, which will be served to the marching Krewe members on Krewe of Cork parade day. Among Browne’s other holdings, Patrick pours Gruet Methode Champenoise Brut sparkling wine. 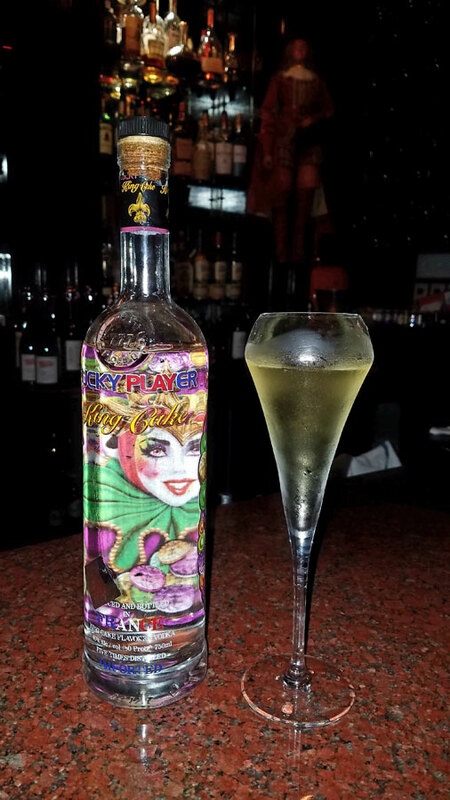 “It also makes a refreshing Mardi Gras cocktail mixed with King Cake vodka, which will also be featured at Patrick’s Bar Vin during the carnival season. While, just off Bourbon Street, Patrick’s Bar Vin has a somewhat secluded entrance, which upon entering has a very different style and vibe than most of the bars in the French Quarter. In addition, Bar Vin has a huge covered patio for parties and other events. The bar is most always lively and celebratory, particularly around special occasions. And, there’s always “one more for the road” for patrons!